107369 MVA and operating around 43059 CKT KM Transmission Lines and having work force of 16000 employees. MAHATRANSCO is released notification to recruit the experienced, talented, profession and dynamic persons for Assistant Engineer and Executive Engineer cadre posts. 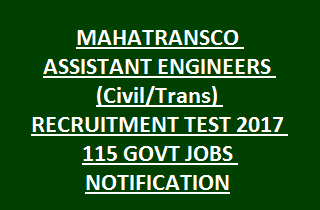 There are total 115 vacancies available in the current recruitment of MAHATRANSCO Assistant Engineers notification. Online registration for this MAHATRANSCO Assistant recruitment will be closed on 15-11-2017. Online test will be conducted in the months of December 2017 or January 2018. Selection for this recruitment will be based on the online written test and personal interview. For more details please see the below furnished information. As on 15-11-2017 upper age limits for Assistant Engineers MAHATRANSCO Recruitment is 35 years. All type of reserved candidate's age relaxation will be given up to 40 years. For the post of Executive Engineer (Trans) a Bachelors Degree in Civil Engineering / Technology is required. And the candidate must have 9 years experience in the field of civil works related to Power Sector or 2 years work experience as Additional Executive Engineer. For the post of Assistant Engineer (Trans) a Bachelors Degree in Electrical Engineering / Technology is required. For the post of Assistant Engineer (Telecom) Bachelors Degree in Engineering in the stream of B.E. (Electronics & Telecommunication) OR B. Tech (Electronics & Telecommunication) is required. For the post of Assistant Engineer (Civil) Bachelors Degree in Civil Engineering / Technology is required. The selection for Assistant Engineers will be held based on online written test and personal interview. Final list will be prepared based on merit in written test and personal interview. For general candidates application fee is Rs.700/- for all the others Rs.350/-. Click here to apply online for Assistant Engineers Recruitment 2017. Click here to apply online for Executive Engineers Trans Recruitment 2017. The Eligible candidates can apply through online only. Before applying online must have read the user instructions and official advertisement of MAHATRANSCO. The candidates have to pay the application fee through online only using credit or debit card or internet banking. Last date for registration is 15-11-2017. Click here to see the official notification of Maharashtra State Electricity Transmission Company Ltd Assistant Engineers Recruitment 2017. Please share this recruitment notification of Maharashtra State Electricity Transmission Company Ltd Assistant Engineers Posts to your beloved friends through social media sites.